I am an old guy; my bucket list is modest but I am trying to check off the remaining items while I can still fully enjoy them. There’s only one that remains out of my reach: I want to travel to Mars. Not only would I like to see planet Earth from space with my own eyes but as a cosmology teacher, it would give me joy to experience a fraction of the distances that field studies. I am realistic enough to know that it won’t happen. That is, after all, one of the attractions of a bucket list. Well, according to Elon Musk I might yet get my chance. Granted, a ticket will cost me $200,000. Meanwhile, some people might get an even better deal. Stephen Hawking just announced that he’s willing to pay for people’s tickets, although in this case the trip is to Venus. There is only one caveat: the voyagers must “qualify” as climate change deniers. Unfortunately, that takes me out of the running. There is a reason for Hawking’s publicity stunt. There are strong correlations between the conditions one would find on Venus and those we can expect to find on Earth should climate change reach its logical conclusion according to business as usual projections (June 25, 2012). If only I could agree with denier logic that carbon dioxide is a benign gas and all of its links to climate change are “fake news” that scientists fabricate to get grant money from the government, I’d be well on my way toward fulfilling my space travel goals. After all, there probably wouldn’t be that much difference between the experiences of visiting Mars or Venus. Fake news is a popular topic these days. It’s an excellent cover for ignorance – it means that anyone can make or dismiss an argument – whether or not they have supporting facts or reproducible observations to follow up their claim. President Donald Trump announced the U.S. withdrawal from the Paris Agreement on climate change because it is a bad deal for America. He could have made the decision simply because the science is false, but most of the public have been brainwashed into believing it is correct and wouldn’t understand the reason. Canadian Prime Minister Justin Trudeau, and indeed the leaders of many western democracies, though thankfully not the U.S., support the Agreement and are completely unaware of the gross deficiencies in the science. If they did, they wouldn’t be forcing a carbon dioxide (CO2) tax, on their citizens. Trudeau and other leaders show how little they know, or how little they assume the public know, by calling it a ‘carbon tax.’ But CO2 is a gas, while carbon is a solid. By calling the gas carbon, Trudeau and others encourage people to think of it as something ‘dirty’, like graphite or soot, which really are carbon. Calling CO2 by its proper name would help the public remember that it is actually an invisible, odorless gas essential to plant photosynthesis. …CO2 is not a pollutant…the entire claim of anthropogenic global warming (AGW) was built on falsehoods and spread with fake news. …More than any other event, that single hearing before the Energy and Natural Resources Committee publicly initiated the climate scare, the biggest deception in history. It created an unholy alliance between a bureaucrat and a politician that was bolstered by the U.N. and the popular press leading to the hoax being accepted in governments, industry boardrooms, schools, and churches across the world. Trump must now end America’s participation in the fake science and the fake news of man-made global warming. To do this, he must withdraw the U.S. from further involvement with all U.N. global warming programs, especially the IPCC as well as the agency that now directs it—the United Nations Framework Convention on Climate Change. Only then will the U.S. have a chance to fully develop its hydrocarbon resources to achieve the president’s goal of global energy dominance. The Ball and Haris piece claims that people who believe in climate change have been duped by fake news. Their key point is that the notion of carbon dioxide being the chemical largely responsible for climate change is utterly false. Their reasoning is twofold. The first is semantic – they take exception to calling carbon dioxide “carbon.” This is largely an issue of units. Most scientific publications use this association mainly because carbon dioxide is not the only anthropogenic greenhouse gas; other gases, such as methane, are often expressed in terms of units of carbon dioxide. Any transition between the units of “carbon” and “carbon dioxide” involves multiplication by 44/12 or 3.7, which is the ratio of the molecular weight of carbon dioxide to the atomic weight of carbon. I will remind those of you to whom the last sentence is a foreign language that some prerequisites – especially in vocabulary and basic math – are necessary when we describe the details of the physical environment. Ball and Haris’ second objection is that carbon dioxide is not a “pollutant” but an “invisible, odorless gas essential to plant photosynthesis.” While the latter statement is true, it does not represent the whole truth. My Edward Teller quote from last week directly addressed this issue. Essentially, carbon dioxide is a (measurable) pollutant because of its optical absorption properties, i.e. it is responsible for a great deal of the observed climate change because of its preferential absorption of the longer wavelengths of the electromagnetic spectrum. 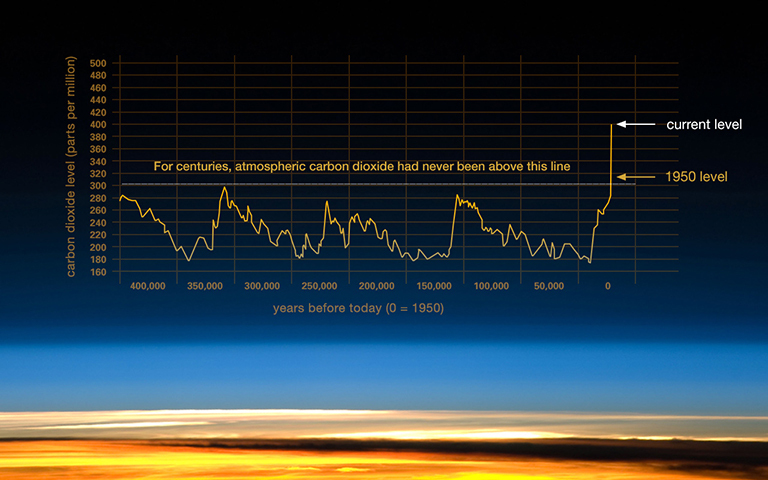 Figure 1 shows the atmospheric concentrations of carbon dioxide over the last 400,000 years. Again, the famous hockey-stick curve shows up in the perpendicular rise after the industrial revolution at the far right section of the graph. Last week’s blog’s data about how carbon dioxide added to the atmosphere between the industrial revolution and the 1950s didn’t have any carbon-14 in it, indicates the ancient origins of fossil fuels. Furthermore, one of my earliest blogs (June 25, 2012) illustrates the carbon cycle (again – much of it in the form of carbon dioxide): where it’s going and where it’s coming from. Photosynthesis and respiration are part of it. Without the anthropogenic contributions (burning fossil fuels, land use change, cement production, etc.) the emission and sequestration balance to explain the long steady state (approximately constant rate) shown in Figure 1. Once we factor in the anthropogenic contributions and how they impact atmospheric absorption properties, we start to see the changing energy balance with the sun and hence the change of climate. Groups that reject established climate science can use the search engine’s advertising business to their advantage, gaming the system to find a mass platform for false or misleading claims. It seems that even parts of the internet that we consider to be neutral are starting to reflect the increasingly combative political climate and the related problem of fake news. This entry was posted in administration, Anthropocene, Anthropogenic, Climate Change, IPCC, Sustainability, Trump and tagged Adaptation, Anthropocene, Carbon, Carbon Cycle, carbon dioxide, Clean Energy, Climate Change, Climate Change Denial, Climate Change Deniers, climate science, Climate Skeptics, CO2, CO2 emissions, denier, Donald Trump, Edward Teller, Elon Musk, Emissions, Energy, energy transition, Environment, fake, fake facts, fake news, fake science, false, Fossil Fuels, Global Warming, Google, greenhouse gas, hockey stick, James Hansen, Mars, Methane, News, pollutant, Pollution, reproducible, Science, scientist, Stephen Hawking, Trump, US, venus. Bookmark the permalink.